My passion for seed started while I was at university studying Human Ecology and came from a political perspective initially. I was shocked to learn about the concentration of control and power within the global seed industry, and how traditional varieties and the precious genetic diversity within them were being wiped out by the thousands. My interest in seed developed from there when I started growing food in 2012. I was fortunate enough to spend time managing the gardens at a project in Spain called Sunseed and this is where I was first able to grow a lot of seed. We dedicated a whole garden to seed-saving partly because it just seemed like a sensible option and partly to stop people from eating all of the seed crops! After Sunseed I worked at Embercombe which is where I got a taste of commercial seed production through growing seed for the Seed Cooperative. The more I work with plants the more in awe I am of them, particularly their many and varied reproductive strategies. Plants perform miracles, and by far the most miraculous thing they do in my opinion is produce seeds. From a genetic perspective seed is a tool (amongst other things), and as with any situation it’s important to have the right tool for the job. One of the most important aspects of seed production is selecting the plants which will be invited to pass on their genes to the next generation. We select the plants for various traits and abilities to withstand the various ups and downs of life including water shortages, visits by hungry insects and diseases, very low temperatures etc. If we want to grow crops in organic systems its important that the varieties have proved themselves to be able to cope with the specific conditions associated with those systems, and the climate in the area where they will be grown. From an ecological perspective it has never been more important to support organic farming. The chemicals which are used in ‘conventional’ farming are poisoning and undermining the unique and vital soil ecosystems which we need to support us into the future. Not to mention all of the above-ground decimation of insect populations that comes with the widespread use of insecticides on crops. When did you set up Vital Seeds and why? I started Vital Seeds in 2018 in response to the severe lack in availability of UK-grown organic seed. I was shocked when I found out how little seed is produced in the UK and how most ‘local’ organic food is produced from seed shipped half way across the planet. There are very few companies specializing in organic / agro-ecological seed in the UK so it seemed there was definitely a need for more. My dream is to improve existing varieties and develop new ones specifically adapted to ecological growing systems, although this is a very long term goal as it can take many years to breed new varieties. My favorite variety is a tomato called Black Cherry. They have a superb flavour, not too sweet, not too acid and are very juicy in texture. They have an amazing colour which is the result of a natural mutation discovered by the legendary tomato breeder Vincent Sapp of Tomato Growers Supply in 2003. I grow them every year and eat them by the bucket load! We had a plant which was particularly productive in 2018 which have kept the seeds from separately. We will grow the offspring from this plant next year adjacent to the standard Black Cherries and see if they might be the start of an extra-productive genetic line. 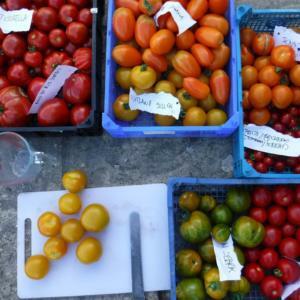 Vital Seeds is an independent seed company based in Devon, producing and selling organic and ecologically produced open-pollinated vegetable, herb and flower seed for home-growers and small-scale market growers. Vital seeds was founded in 2018, in response to the lack of availability of UK-grown, organic and open pollinated seeds. 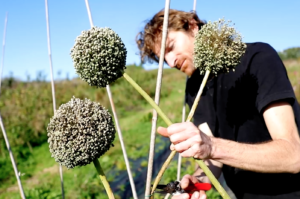 Co-founders Fred Groom and Ronja Schlumberger offer a sustainable and local alternative to the majority of seeds that are planted in the UK, many of which are grown thousands of miles away in countries with a dryer climate and cheaper labour. They are based at Westford farm, on the north edge of Dartmoor. Here in their converted barn, they process seed and test it’s germination quality in a specialist ‘germination oven’. It is here that they test their seeds twice a year to check it’s still top quality! Part of Vital Seed’s mission is to re-skill gardeners and growers in how to save their own seed, and to revive this ancient and fascinating craft! For further information, take a look at the Vital Seeds website and watch a short film of Fred in action.